Since 2002, we’ve been at the forefront of bringing Japanese import cars to the UK. 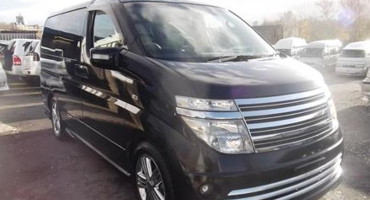 Supplying some of the best MPV cars on the market, we have 8 seater cars and 7 seater cars for sale, mini mpv’s and camper vans, as well as specialist disabled access vehicles. We also have an extensive range of SUV’s, 4 wheel drives, all wheel drives and estate cars from all manufacturers of Japanese domestic market cars (JDM cars). If you’re thinking about buying an import car from Japan use the search box on the right as we carry one of the largest inventories of Japanese cars for sale in the UK. As a Jap imports specialist, we have new stock arriving each and every month but if you can’t find exactly what you’re looking for in our inventory it’s always worth calling us as we may well be able to source and import a vehicle closely tailored to your specifications. All you have to do is sit back and relax whilst we take care of everything. You will be the 1st UK owner. The car comes fully registered with UK plates. 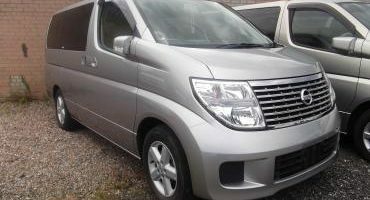 We have a wide selection of Japanese Import 7 and 8 seater people carriers of high specification & quality at affordable prices. Disabled Access vehicles in stock. 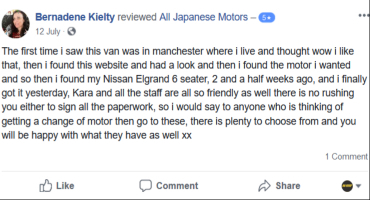 23 pages of testimonials will give you a feel for how we do business and about the high levels of customer service you can expect from KV Cars Ltd.